In the last few years, INSOFE has been synonymous with Creating Global Leaders in Data Science. INSOFE sets itself apart by focusing on imparting lectures in the classroom and also ensuring a technical approach for every individual enrolled in the program through lab-sessions with cutting-edge technologies. 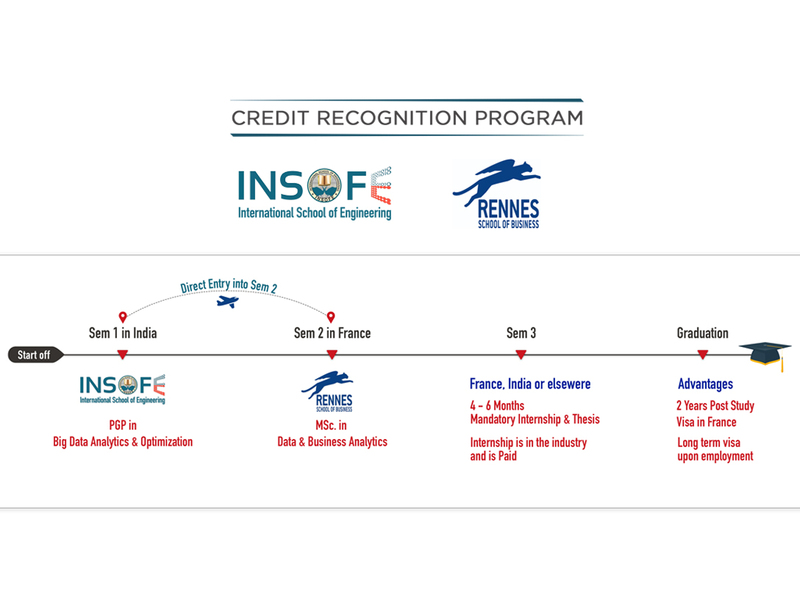 Based on the quality of the course, INSOFE was featured in CIO.com’s distinguished list of ’26 Big Data Certifications That Will Pay Off’, the only institute to be present for 5 consecutive years from India. Rennes SB, a globally reputed business school was looking to partner with an authority in applied engineering from Asia. 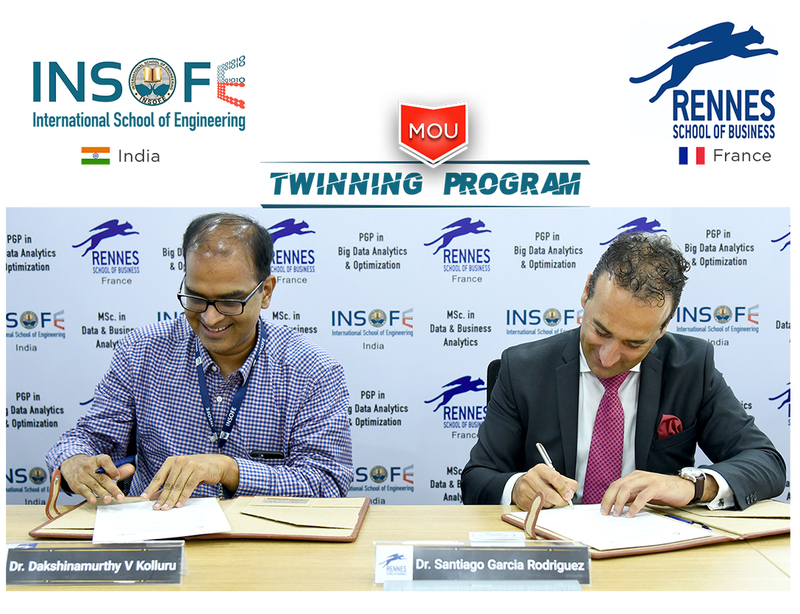 INSOFE’s meteoric rise from being a certification institute in India to one of the largest Data Science, AI & ML Institutions drew the attention of Rennes School of Business towards a collaboration with INSOFE. The plan was to create a variant of Rennes SB’s M.Sc. in Data and Business Analytics program for students who underwent the Data Science Certification from INSOFE, a program that suites Indian Students. The journey of a student starts in India & finishes in France. Best of all, INSOFE-RENNES prescribes No Work Experience, No Age Limit and No IELTS & GRE required. Why RENNES School of Business? Rennes School of Business is considered to be one of the best International Management schools in Europe. Programs here, are taught in English here to accommodate students from various nationalities under a common set of guidelines. 53% of students and 91% of the Faculty being international, Rennes School of Business has its own cultural heritage value. Connected with a network of 260 main partner universities worldwide, international research and teaching cooperation and the triple accreditation (EQUIS, AACSB, and AMBA) attesting its academic excellence. The Triple Crown accreditation is a very prestigious recognition. Only 90 of the 13,500 B Schools across the world have been conferred with it. Looking at all the above factors, Rennes School of Business makes school, a unique place to live and study. The Twinning program is designed to help young zealots nurture the technical competencies as well as the ability to identify the crux of the problem in any business belonging to any industry in real-time. As a part of the program, students would be spending Sem – I i.e. 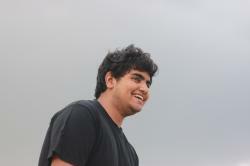 the first 6 months in India, where they would be trained on powerful new – age technologies. Then they would be flying to Rennes, France for Sem – II for the next 6 months, they’d be taught how to tackle evolving business challenges. During Sem – III, students would be undergoing an Internship program anywhere between 4 – 6 months working in the industry. And this internship can be pursued anywhere in the world. The Twinning program exceeds industry expectations by helping students transform into Futuristic Techno Managers. Just in the last 8 years, 715 companies have claimed to be in the AI industry and more than 400 AI startups have been established in the continent of Europe. The President of France, Emmanuel Macron is planning to invest EUR 1.5 Billion by 2020 in the Data Science Race for a smarter approach. The European Commission is increasing its annual investments in AI by 70% under research and innovation. Looking at all the above factors, AI in France is taking great strides and this is the right time to join and be a part of the revolution. Many traditional companies are actively looking to build a Data Science expert team consisting of both think tanks as well as coders to handle their data requirements. 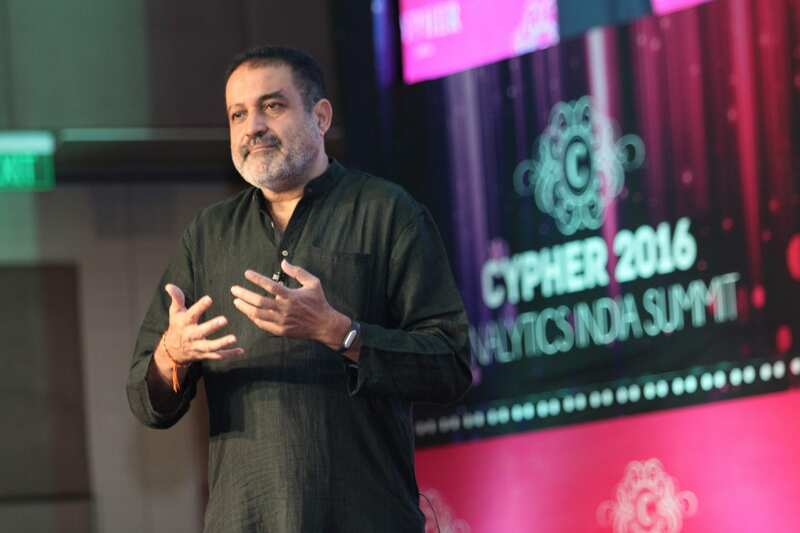 And even more, companies like Capgemini, SAP, Salesforce, EY, Boston Consulting Group, and so on, who have already established their branches from many years and are actively on the lookout for Business Analysts and Data Scientists. France is ranked 4th among host countries for international students after the US, UK and Australia. And Rennes has been nominated as the best city in quality of life and sustainable living. The government has introduced multiple visas for international students provided they complete their studies. To make the transition as smooth as possible, a welcome desk for English speakers, an advisor assigned to support students with better access to accommodation are provided. It costs more than 40 lakhs to pursue a Master’s program in most developed nations. The Twinning program at INSOFE costs less than 20 lakhs, due to the scholarships awarded to the students. This coupled with high paying AI jobs, makes it one of the best ROI Masters programs in the world. 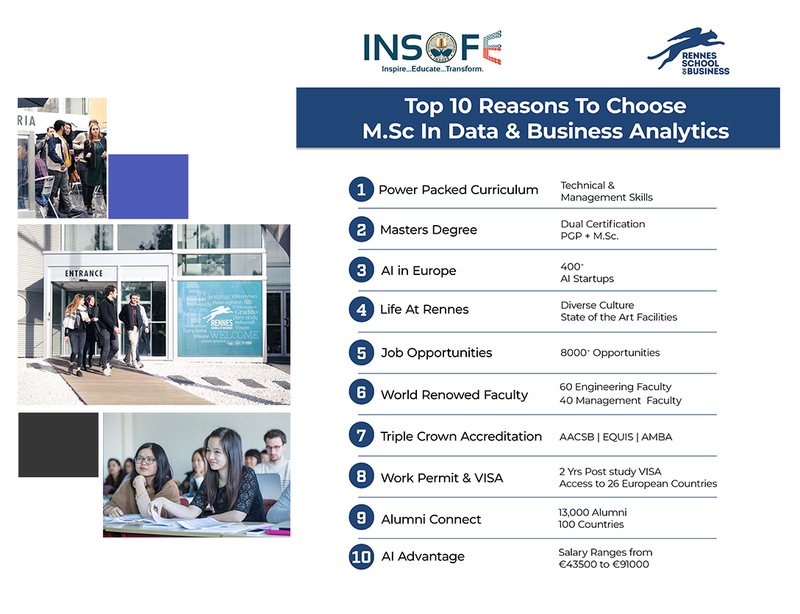 At INSOFE, students being a part of the Master’s program, aren’t only getting a degree, they are also getting exposed to a whole new world of opportunities that pave the path for a Data Science expert to become a Global Data Leader.